Every so often we stumble across a online/high street store that we instantly fall head over heels for, either because they are offering such a great service or are helping to promote the sport of BMX or street riding as a whole. 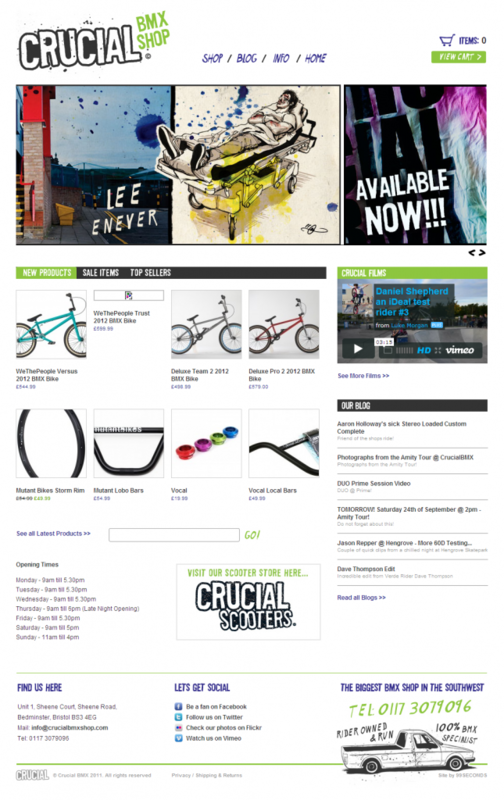 One such store came onto our radar recently which is called CrucialBMX Shop. They have a massive selection of parts online and in store and are probably one of if not the biggest show room in the South West of the UK. These guys popped onto our radar after a film by a guy called Paul Ireland was shot at one of our local BMX parks in Trowbridge. CrucialBMX aren’t just providing a good service to the general public, but they are also organising competitions, they have their own team riders and are making some great motivational short films. With the economy being so tough at the moment and small independent stores in all sorts of categories going into administration we think its very important to promote stores that are doing a great job and that we don’t want to see fail. Great job guys keep up the good work!